Tom with Fr. Bill Henry and parishoners, St. Alphonsus Lentern Parish Mission, MaComb, MS---April, 2000. Schedule a Parish Mission with Tom Edwards---see Home Page for contact information. "Tom is a fine emissary of evangelization because he is an effective and dynamic communicator. His mission has been very well received, not only in our Diocese but in other areas of the country and internationally as well. I would highly recommend that other parishes and institutions utilize Tom's gifts and talents." "Mr. Edwards has been involved in a special parish ministry "Journey into Scripture Parish Mission". The parishes in the Archdiocese of Miami that have been a part of the "Journey" have found it challenging in living their life of faith. On their testimony, I wish to recommend to you the service of Mr. Tom Edwards---." "Tom's ministry is to bring the Words of Scripture to life so that God's revelation may transform the lives of His people---Tom enables participants in the mission to experience the power of the Word of God. I am happy to recommend Tom's ministry to you. He is able to tailor the mission to fit the particular needs of your parish." "Tom and his wife Pam are members of our parish. 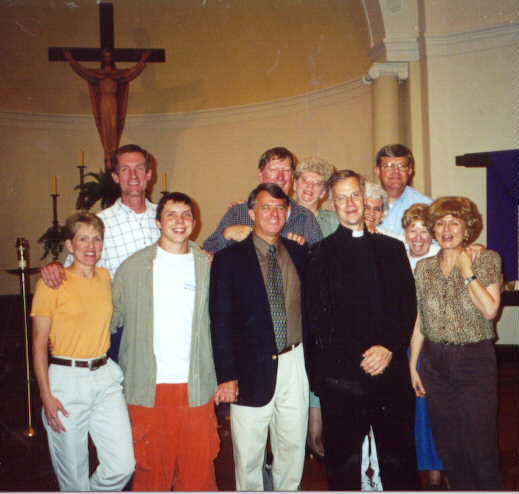 Tom conducted a Lenten Renewal Retreat in our parish in March, 1994. I can recommend him without reservation to any pastor who invites him to help lead the people in the footsteps of Our Savior, Jesus Christ." "It was one of the best missions we've had here in 19 years at Christ the King. I want you back----"
"The Advent Mission was enjoyed by all who attended. It was both informative and spiritually uplifting. As a committed lay person Tom can really speak to the people in a way that perhaps many clergy can not. The basis of all his talks are either scriptural or from the documents of the church"
"We, the Norbertine Fathers, having pastoral care over the parishes of St. Andrew's at Ocean View, and St. Joseph's at Kommetjie, Cape Province, South Africa would like to publicly record our thanks to Mr. Tom Edwards for his work among us. We were inspired by his enthusiastic teaching of the truths of our faith. He worked well with us in evangelising our parish communities. We do not hesitate to recommend him most warmly in the service of other parishes." "Your ministry and example serves to challenge all of us, clergy and laity, to grow in our awareness of God's call and the implications that are inherent in our Baptismal response." "Thank you for the excellent week of presentations you gave our parish--.I appreciated how you could hold the interest and continued attendance of such a wide range of parishioners, some who get hung up on church issues and fail to hear Jesus in the Gospel. There were favorable comments across the spectrum of people including the talk you gave to the teens." "Tom was sensitive to the spiritual needs of my parshioners"
"Your themes were most inspiring and spiritually uplifting for all present"
"You really do make the scripures come alive in my mind and my heart. "We came to appreciate more deeply this new kind of lay ministry in the Catholic Church because it enables laypeople to share their gifts and insights"
"I am sure that those who were able to attend were blessed in special ways and were nourished by the Word of God. Your presentations and your enthusiasm were also appreciated." May I thank you on behalf of the whole parish for leading us through the Scriptures in our renewal for Jubilee Year 2000 AD. Many people have told me that the Sprit has encouraged them with a sense of mission and with and enthusiasm to be evangelists. I was particularly grateful for the way in which you challenged our young people in St. Theodore's and St. Hilda's to live according to the gospel of Jesus Chrish." "Tom conducted a mission at St. Hedwig's Parish during the season of Lent 1996 and we were very pleased with the results, and the approval of those who attended these sessions". "Tom, your calm demeanor, clarity of thought, obvious affection for the Catholic Church, even your methodology of placing the succession of scripture quotes--and in our case John Paul's Mission of the Redeemer--were powerly effective. I was actually surprised at the cross section of opinion and style among our people to which you appealed." "Tom Edwards is the first lay evangelist approved by a Bishop in Florida. For twenty five years I have watched the maturing and expansion of his ministry. He has had a desk in my office for fifteen years. America, Canada, England and Wales, Africa, Slovakia and now Kazakhstan have known his zeal and call him back again and again." "Your doing what you are doing is a dream come true for me, because I learned my theology in the forty's. At that time there was great stress on the importance of the laity to realize that they have obligations of "witnessing" and taking an "active role in their faith. I have received many comments of praise and even letters thanking me for having you here." "It is with great appreciation that I am writing this thank you letter to you after our Lenten Parish Mission of February, 1989. Your obvious love for God's Word has nourished hundreds of people in our parish and area. I hope that you will be able to visit us again and conduct another mission some time in the future." "Many lives were touched in a very authentic way. We're still hearing from people who were edified by the presentations and who were challenged to respond in a more radical way to the call of the Lord's gospel." "You truly have inspired the people of Sacred Heart Parish towards the understanding and appreciation of Scripture and Church Teaching. Our parish is already receiving many blessings; people are renewing in their faith." Fr. James R. Boddie, Jr.
"I can not tell you how much your 3 day mission of Scripture meant for our RENEW team and especially the young people of our parish. I mean it was fantastic--your clear, profound presentation of Scriptural principles along with a conviction of yours that the Holy Spirit imparted made your "Journey through Scripture" quite memorable for us"
"Greetings for RAF Alconbury, UK. I can't thank you suffieiently for your outstanding work for this community. The Catholic parish continues to increase in size and level of commitment. These can be attributied to your dynamic presentations of the Lord's message." Many were truly inspired by your words and especially your sincerity and insight in sharing the "Good News"
"Best retreat we've ever had in this parish", "I really felt touched by the Lord" are among the comments I have already heard about this parish retreat"
St. John Vianney. Cumberland, R.I.
"Tom Edwards posseses a tremendous sensus ecclesiae. His preaching is Christ centered, authentically scriptural, and in the best Catholic tradition." "Sincere thanks for the excellent mission you gave to our parish community. Your delivery was certainly excellent as seen by the number of people who kept returning each night and brought others." "I look forward to your return in Oct., 1992. Once again thank you for a very fine week-end which all who had the opportunity and priviledge to attend enjoyed." "I would like to thank you most sincerely for the wonderful mission you preached here in St. Ambrose last week to help me and my parishioners prepare for our coming celebration of Easter"
"Thank you so much for bringing Our Lord and your ministry to Corpus Christi, it has made a big difference". "I highly recommend that other parishes and institutions utilize Tom's gifts and talents." Tom thank your for keeping me informed of your vital ministry"
But more than your talks, the single witness of your life and what can happen in a person's life, a lay person, when they make themselves totally available to the promptings of the Holy Spirit."